Enanthate testosterone pharmacom very popular among domestic builders. The drug can be administered only once a week, but sometimes athletes place two injections in this time period. Pharma Test e 300 pharmacom price is low, which also makes it very attractive for amateur bodybuilders. 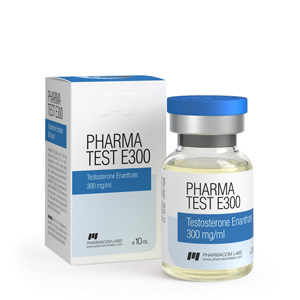 All athletes who have sufficient experience in the use of anabolic steroids and who wish to conduct a powerful mass-set course can safely recommend test e 300 pharmacom to buy. It should also be noted that pharmacomist testosterone enanthate is practically the same as cypionate (another prolonged male hormone ester) and you can safely replace one of them with another if necessary. Anabolic activity is 100 percent compared to the male hormone. The ability to convert to female hormones (aromatization) is high. The duration of exposure to the body – 14 days. The time of detection of traces of the drug using the doping test is three months. The most powerful increase in muscle mass. A large amount of fluid is retained. The rate of synthesis of protein compounds increases.